Some games require access the web. When? 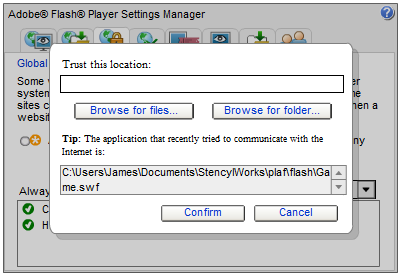 Whatever the reason, to test whether your Flash game is connecting to other sites properly, you must let the Flash Player access the Internet. Why do we need to allow the Flash Player to access the web? "Some websites may access information from other sites using an older system of security. This is usually harmless, but it is possible that some sites could obtain unauthorized information using the older system." For more information about Security Settings and why it exists you can visit Adobe's website. How do I let games created with Stencyl access the web when testing locally? 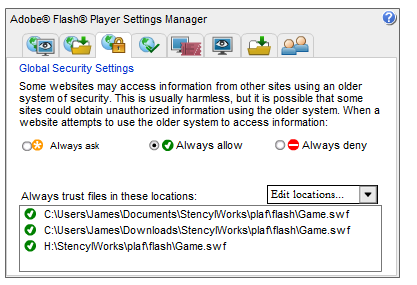 To allow games made with Stencyl to access the web when testing them locally, you need set the permissions for your game's SWF in the Global Security Settings Manager on Adobe's website. Below is a screenshot of what the panel looks like as well as what the location for a Stencyl game would be. Unless you maintain multiple copies of Stencyl for testing purposes, you will have just one location to specify. Tip: Your WORKSPACE directory can be discovered by going to Debug > View > View Workspace from the top menu. To set the permission for your SWF to access the Internet, first open Stencyl. Then, you want to open a game you know will want to access the web. Test the game and have it attempt to access the web. Now, you will see a security alert display, similar to the image below, informing you that the game is attempting to access the web. To set the permissions, click on "settings." It will bring you to the Global Security Setting panel as noted above. When you are on this page, you want to click on "Edit Locations," which will display a dropdown menu. Next, click "Add Location." It will display a dialog box as shown below. When you see this box, click on "Browse for files..." It should open a new dialog that contains the directory where the SWF is stored. Select the SWF and click "Open." This will add the necessary file to the permissions list. Once this is completed, any game created in Stencyl that is tested locally or in the browser will be able to access the web. At adjustment Flash Player I don't have option "to resolve browser"
Neat! Will use in the future probably! Just one thing, Linux has forward slashes (/) not backward slashes.